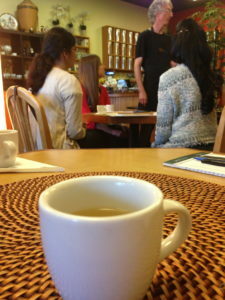 We have Public Tea Tastings & Classes each month as well as the option to book a private tasting with our staff in your location or in our beautiful and unique tea shop. Whether you are in our shop or have one of us come to your company, organization, meeting or party, we are always excited to share the wonderful benefits of organic tea. Learn more about our Certified Tea Master, the late Thia McKann, the first Certified Tea Master in Texas! Tea Tastings are taught by Chris McKann who has a wealth of knowledge having participated in over 1,000 tea tastings over the past 5 years. For a tea tasting we prepare 6 teas: white, green, oolong, black pu-erh and rooibos. As we serve each tea we tell you all about the tea; where it comes from, how it is processed, and the health benefits of that type of tea. We also share ways to brew the best tasting teas. We talk about the best water to use, how long to steep each type of tea, and the optimal water temperature. We look at different ways to make tea, as well as the differences between coffee and tea. We talk about some of the tea rituals used by different cultures. For parties of 20 or more we will close the shop. The fee is based on the number of people. Please call 713.252.4473 to reserve your place, regardless of where you purchased your ticket. If you would prefer to buy your ticket over the phone or at the door, please call us at 713.252.4473. If you purchased a voucher from a “deal-type” service, such as Groupon, Living Social or Amazon Local, please call us to reserve your place for the tea tasting. All Wednesday night tastings are from 7pm to 8pm. Every week, with very few exceptions, we host an Intro to Tea Tasting class every Wednesday night from 7pm-8pm. These events fill up very fast. We are typically booked 1-2 months in advance, for our Wednesday night tea tasting events. Please call us at 713.252.4473 to reserve your space.